Harrow is a rural village in the southern Wimmera region of western Victoria, on the west side of the Glenelg River. It is about midway between Balmoral and Edenhope. The New South Wales Surveyor-General Thomas Mitchell, crossed the river near Harrow on 31 July 1836, on his Australia Felix expedition. Originally known as Upper Glenelg, Harrow is situated at a crossing place on the Glenelg River. In 1849 there were a postal receiving place, the Foresters Arms Inn, a store and a blacksmith. In 1852 the township was surveyed. The surveyor renamed the place Harrow, presumably inspired by Harrow, England. A police post was established there in 1853. Harrow is a very early distant inland town, although Apsley (closer to the border) was surveyed a year earlier. Its oldest surviving building is a log gaol (1859). A Presbyterian church was constructed in the early 1860s, and served as the first school buildings which began in 1869. The town is set in hilly surrounds, beyond which are plains occupied by several historic pastoral properties. They include Clunie Estate with a large bluestone woolshed, Pine Hills (c1858), Mullagh Station (1866) and Kout Norien (c1855). A slab cottage, woolshed and other outbuildings (1848) at Kout Norien are on the Victorian Heritage Register. Mullagh Station’s name was attached to an Aboriginal cricketer, Johnny Mullagh, who was in Australia’s first touring side in 1867. He is buried in the Harrow cemetery. The annual Mullagh Cricket Cup (1995) is contested each year in Harrow between the Indigenous descendants of the first Australian team versus cricketers from the Western District of Victoria. The Presbyterian church was by far the grander, replacing an earlier structure in 1884. The Anglicans built a church in 1933. Unusual in a town of such size, a bush nursing centre was opened in 1913, and it was rebuilt in 1995 at a time when such facilities were at risk of closure. Harrow’s sense of history resulted in the formation of a historical society in 1969, with an eye to the preservation of the log gaol. The gaol has since been listed on the Australian and Victorian heritage registers. 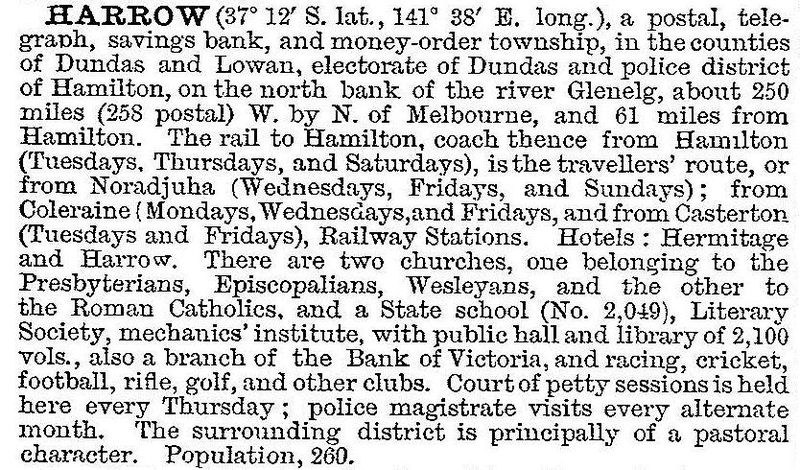 Mullagh and Pine Hills homesteads are also on the Australian register, along with old bluestone offices which served the Kowree shire during 1872-87. Harrow has three churches, the bush nursing centre, the mechanics’ institute, the Hermitage Hotel, a general store, a museum, a recreation reserve, a golf club and tennis courts. The school closed in 2002. The Johnny Mullagh Cricket Centre was developed by the Harrow community as a means of celebrating the story of the 1868 Aboriginal cricket team and the history of the Harrow township. At the 2011 census, farming accounted for 47.3% of employment.